Non-Governmental Organizations (NGOs) believe that the decision of the High Council of Justice regarding the lifetime appointment of Tbilisi Court of Appeal judges is unacceptable and it raises serious questions about the qualification and impartiality of judges. The NGOs presented their position over the developments in the judiciary system of Georgia at a special conference on Thursday, which gathered together representatives of the civil society, diplomatic corps, legislative and executive bodies and media. Ana Natsvlishvili, head of the Georgian Young Lawyers Association (GYLA), believes that the government made unwise concessions to powerful groups in the court, which was a serious blow to some positive steps taken by the same government since 2012. “Despite some positive steps that have been taken in terms of legislative changes, fundamental challenges still remain in the judicial system, which has not been reformed. The implemented changes are not perfect,” she said. 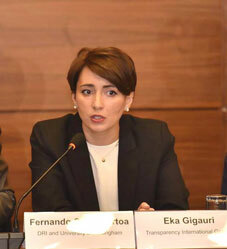 Executive Director of Transparency International-Georgia, Eka Gigauri, says that they disapprove of the practice of the appointment of judges for a lifetime. “We have a lot of problems in the judiciary and despite the fact that in certain cases we may have some improvement, trust in the judiciary is very low in our society, because today we are not able to appoint dignified candidates in court,” Gigauri said. Deputy Public Defender Natia Katsitadze underlined that fundamental reforms in the judicial system are necessary. “The Ombudsman has stated many times that there are question marks about the transparency of the judges’ appointment process and we think this issue still remains problematic,” she said. US Deputy Ambassador Nicholas Berliner noted that independent and transparent judicial system is important for the process of Euro-Atlantic integration of Georgia. "The US consistently supports reforms in this sector. We also support civil society organizations in their efforts to openly and critically assess the reforms and the remaining gaps," said the US Deputy Ambassador to Georgia. Janos Herman, the European Union Ambassador to Georgia, stated that the EU supports the implementation of reforms in the judicial system of Georgia. "The support of judicial institutions has been further strengthened after signing the Association Agreement (AA). The Association Agreement states that justice should be free from political or any other form of interference. This is one of the main commitments of the AA," said Herman. Eka Beselia, Chair of Parliament’s Legal Issues Committee, stated that judicial reform and strengthening the judiciary are the main priorities of the government. “From the difficult situation we had in the past, we are moving forward with quite progressive steps. We have completed reforms in this field, but this process continues,” she claimed. Several days ago, the NGOs also issued statement regarding the lifetime appointment of judges. “The main problem with the position held by the High Council of Justice is that it plans to appoint judges without any consideration of whether they deserve lifetime appointment,” the statement reads. The civil sector called on Parliament and the High Council of Justice not to adopt the decisions on the automatic lifetime appointment of judges assigned for a probationary period without a proper evaluation until legislation becomes compliant with the decision of the Constitutional Court of Georgia. “Parliament should not delay make accessible to the public the information about the status of enforcement of the decisions adopted by the Constitutional Court, publish the drafted legislative amendments and ensure the implementation of legislative amendments within the timeframes established by the courts with the involvement of all interested parties,” the statement of the NGOs reads.